Specialities.Chinese call menopause "A Second Spring”. Treatment adjusts for transition in the balance of hormones. 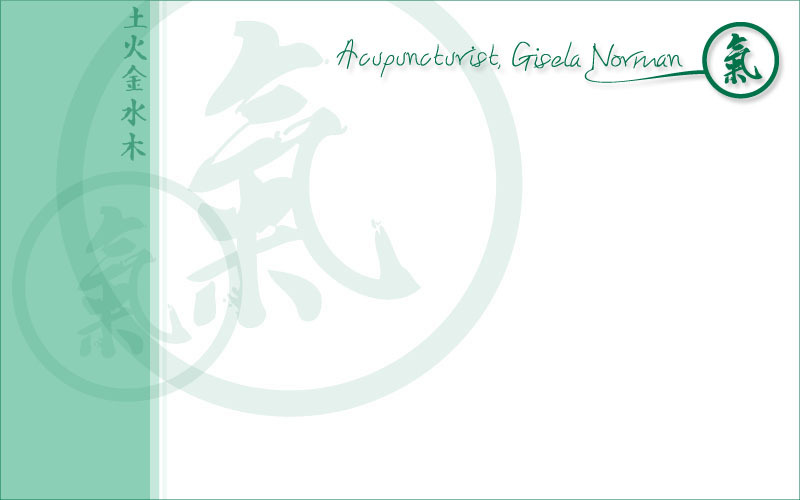 Studied with Giovanni Maciocia in gynaecology, menopause and fertility. In Chinese medicine the changes that are brought on in a woman’s life are seen as an important and powerful time. No wonder the Chinese call menopause "A Second Spring"! With lessened responsibilities she is now freer to pursue her life and personal dreams; it is her time now for her creativity. She has gained a tremendous life experience and wisdom allowing for possibilities that will allow her to blossom into who she is during this phase of her life. The aim of treatment is to help adjust to this natural transition more quickly and smoothly and to ease the unwanted effects from a change in the balance of hormones. Gisela has gained more clinical knowledge through study with Giovanni Maciocia in gynaecology, menopause and fertility.